Crossdocking is a logistics technique used in the retail and trucking industries to rapidly consolidate shipments from disparate sources and realize economies of scale in outbound transportation. Crossdocking essentially eliminates the inventory-holding function of a warehouse while still allowing it to serve its consolidation and shipping functions. The idea is to transfer incoming shipments directly to outgoing trailers without storing them in-between. Shipments typically spend less than 24 hours at the facility, sometimes less than an hour. Here's how it works: in a traditional warehouse, goods are received from vendors and stored in devices like pallet racks or shelving. When a customer (e.g., the consumer or perhaps a retail outlet) requests an item, workers pick it from the shelves and send it to the destination. In a crossdock, goods arriving from the vendor already have a customer assigned, so workers need only move the shipment from the inbound trailer to an outbound trailer bound for the appropriate destination. The already part should make you think of information system requirements - a chief obstacle to implementing crossdocking successfully. One way to classify crossdocking operations is according to when the customer is assigned to an individual pallet or product. In pre-distribution crossdocking, the customer is assigned before the shipment leaves the vendor, so it arrives to the crossdock bagged and tagged for transfer. In post-distribution crossdocking, the crossdock itself allocates material to its stores. For example, a crossdock at a Wal-Mart might receive 20 pallets of Tide detergent without labels for individual stores. Workers at the crossdock allocate 3 pallets to Store 23, 5 pallets to Store 14, and so on. Pre-distribution is definitely more difficult to implement because the vendors of the crossdock must know which customers of the crossdock need what before they send the shipment. This involves quite a bit of information transfer, system integration, and coordination. For a distributor with hundreds of vendors, the problem is very big! We have been working on operational and design problems in crossdocking for several years. Our early work focused on terminals in the LTL trucking industry, but our recent work is more oriented toward retail crossdocking. Most of what we do concerns what happens inside the crossdock. How should managers assign trailers to doors? There are really two questions here: how should outbound trailers be assigned to doors, and where to put inbound trailers when they arrive? We have looked extensively at these problems. The first problem is commonly called the layout problem; the second is called the trailer spotting problem. A good layout places high-flow trailers near one another, but not so close as to cause congestion. We have built models to address both the layout and trailer spotting problems. What shape should the crossdock be? Crossdocks for many firms can be very large, so to reduce the interior distances that workers have to travel, some have experimented with different dock shapes. We have seen docks in the shape of an L, T, and H, in addition to the traditional rectangular design. 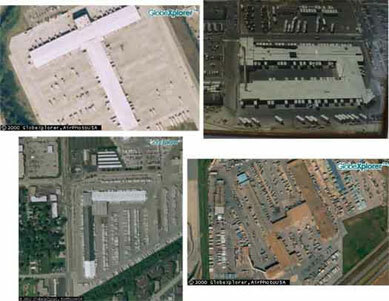 Here are overhead shots of several facilities. Upper left is a T-shaped FedEx Freight (formerly American Freightways) facility in Atlanta. Upper right is a U-shaped Yellow Freight facility near Seattle (this one has been destroyed). Lower left is an L-shape, also from Yellow Freight. Lower-right is the world's largest LTL dock near (where else) Dallas. It has about 550 doors. About the author: Kevin Gue, Ph.D is a Professor of Industrial & Systems Engineering at the University of Auburn. More information about Professor Gue may be found here. Professor Gue's website is www.kevingue.com.